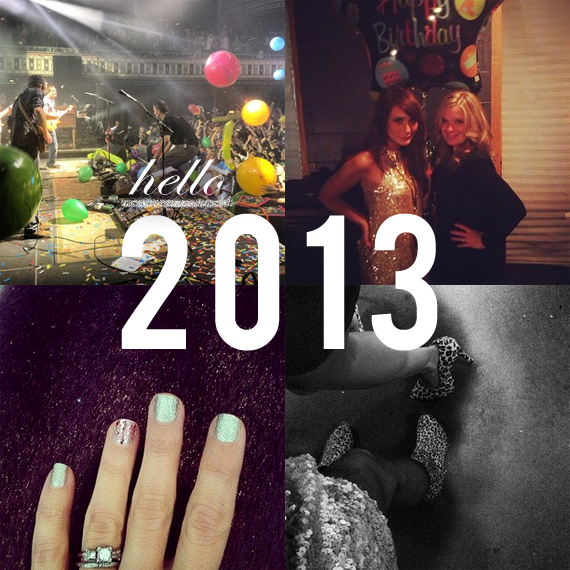 Bubby and Bean ::: Living Creatively: HAPPY 2013! You guys! It's 2013! I took yesterday off for my birthday and travel home from Atlanta, so I'm a day late on my Happy New Year wishes, but I mean them from the bottom of my (equally exhausted and excited) heart. I'm also really thrilled about the new plans and ideas I have for Bubby & Bean - and life in general - this year. I don't do New Year's resolutions because I'm notoriously bad at keeping them going. I think it's incredibly important to set goals, but I'm a believer in a healthy mix of planning and surrendering to the flow. I'm entering this year with a firm grasp on what I'd like to see happen and an open mind to whatever comes my way. It's going to be a good year. Once again, a very happy 2013 to you! And THANK YOU for all the sweet birthday wishes via emails, comments, twitter, Instagram, etc. yesterday. Having a birthday on New Year's Day can be a little weird, and although my birthday admittedly becomes much less of a big deal to me with each passing year, it's nice (and appreciated) to feel the b-day love. You guys are the best. It's a new year, which also means a new month, and a new batch of sponsors (along with some pretty amazing returning sponsors) here at Bubby & Bean. Sponsors help make this blog stay alive and fresh, and this month brings some seriously rad shops and blogs, so make sure you check them out by clicking on their pretty graphics hanging out over there in the right sidebar. You'll be glad you did, I promise! If you're viewing this in a reader, you can see what I mean by clicking here. I like the way you think! People put too much emphasis on new year resolutions and then end up feeling overwhelmed or pressured. Atleast I know I do! I like your plan to plan for go with the flow. =) Happy happy birthday again, it looks like you had a pretty special party! Happy New Year to you and Happy Birthday! And I know what you mean about resolutions I never keep them either. Happy New Year to you too! Hope it bring some new resolutions, lots of excitement and joy! I don't usually do new year resolutions, but this year, I just had one that needs to stick...Exercise. And it needs to be ongoing. But I'm totally with you when you say that it needs to be that healthy mix of planning and going with the flow. Hope you had a great New Year's Eve and Birthday celebration. Happy new year!!! I hope you have a wonderful 2013. Happy 2013! It looks like you have many wonderful things in store for the new year. I'm getting back into blogging after a very long hiatus this year, and am looking forward to reading yours again!